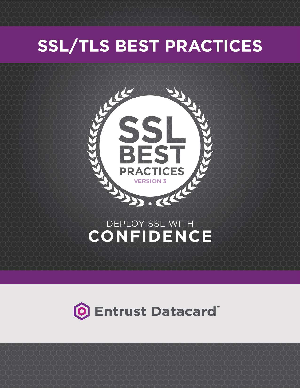 Entrust’s SSL/TLS Best Practices Guide is a key resource for those charged with SSL (Secure Sockets Layer) and TLS (Transport Layer Security) deployment. In our guide, you’ll find expert advice from the thought leaders at Entrust on SSL/TLS certificate installation, and tips for managing security for optimal performance. Our guide is designed to help make SSL/TLS certificate installation easier, so you can use SSL expertly and with confidence.